If you are a small‐scale producer, direct marketing your beef in halves, quarters, and bundles is the best way to be profitable. Here, Mike Lorentz and Arion Thiboumery give you answers to questions customers might ask, and tips for bundling your product and getting going with direct marketing. Here are ten common reasons why people don’t buy meat in halves, quarters, or bundles and what to do about them. Reason 1) I don’t know how much or what I’d get. For a 1/4, divide the above by 2; for a bundle that’s about a 12th or a 20th mix and match so that the whole animal is sold. 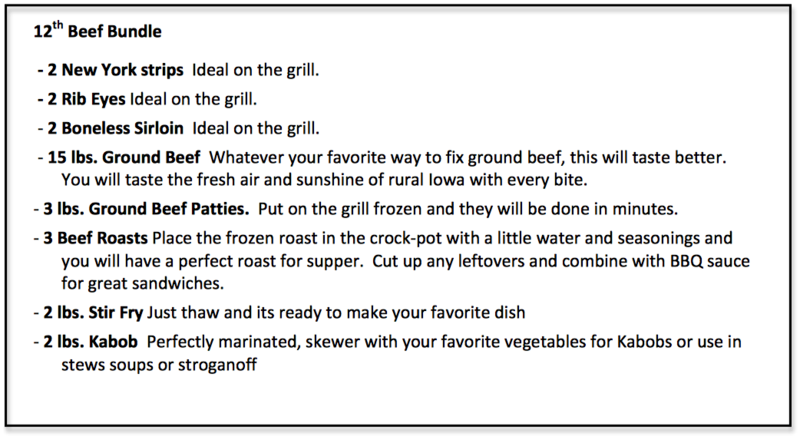 Below is a one example of a 12th of beef bundle, complete with cooking instructions (see Reason #4). This bundle would be about 35 lbs. Sell 12 of these at $195 each ($5.57/lb.) and you’ll make $2,340. PLUS, these bundles do not contain any tenderloin, a high‐value cut that is easy to sell. Reason 2) I don’t know how to order cuts from a half or quarter. Response: Offer to take care of cutting instructions for their first half or quarter and tell them exactly what they will get (see Reason #1 for a general reference). Use a standard set of cuts that you use for your family, or make up something that you think will suit your customers best. Reason 3) I don’t know how or where to store it all. Reason 4) I don’t know how to cook all the cuts. 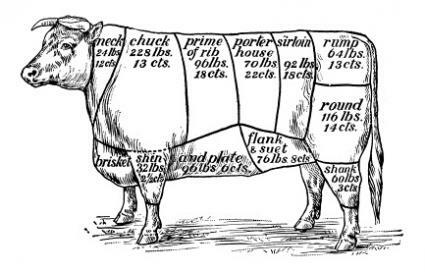 Response: Per the example given for the 12th beef bundle in Reason #1, offer suggestions about cooking all cuts. Assume people know little to nothing about cooking meat. Reason 5) Too Expensive or too much cash up front. Response: Don’t lower your prices! Hold your ground, even if it means losing one sale. You’re in business to make a living, not lose the farm by selling cheap beef. If a half is too much money at once, offer to sell them 1 quarter now, and another later, or sell them a bundle. As a general rule, try not to sell bundles of worth less than $100, these are a lot of time for not a lot of money. You can encourage customers to find another family that wants to “cowpool” and share a quarter or a bundle. It’s an easy way for them to get started with this kind of meat buying. Be transparent about your costs – be straight with them about what it costs to produce this meat, then process, package, and deliver it. If people understand the costs, they’ll be more likely to pay a premium. Work with your bank or your processor to process credit cards. Get a down payment to secure the order. Then when it is time to pay the total seems lower. Reason 6) What if I don’t like it? Response: Stand by your product ‐ make a guarantee of 100% satisfaction. If you include a guarantee in your printed materials limit the time for making a claim to 2 months or less from date of purchase. Offer to either refund or replace only for the amount returned. You don’t want people to get the idea that they can eat all the steaks and return the roasts. Reason 7) It’s more convenient to buy at the store. Response: You will find once you become accustomed to having meat on hand, the “MOST” convenient source of meat is your own freezer. Reason 8) I prefer buying Fresh Meat. Response: Too often people have had bad experiences with frozen meat because the meat was not properly frozen or old before it was frozen. Freezing is nature’s best preservative for meat products. Meat that is vacuum‐packed and frozen at the optimal freshness will taste just as fresh as fresh meat cuts. 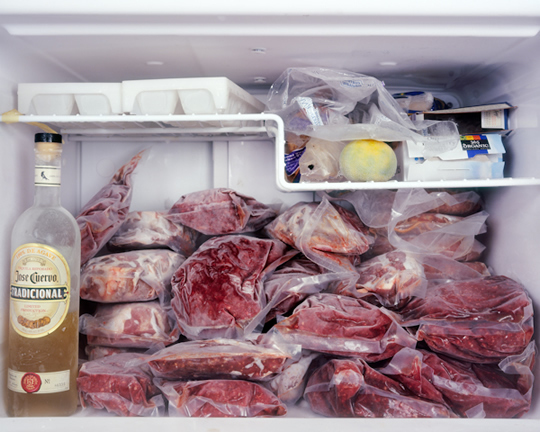 There are 2 simple ways to thaw meat: 1) Take meat out of the freezer and place in a refrigerator at least 24 hours in advance or 2) place vacuum‐packed meats in cool water and it will thaw very fast (paper wrapped meats can thaw in water in a leak‐proof plastic bag). Change the water every 30 minutes so that it continues to thaw. Small packages may thaw in an hour or less; a 3‐4 lbs. roast may take 2‐3 hours. Reason 9) We don’t eat that much meat. Response: A family of 4 will get between 100 and 130 meals of beef from a half beef, 50‐65 from a quarter. Eating beef 2 times per week it will take a family approx 1 year to eat a half beef, or 6 months to eat a quarter. 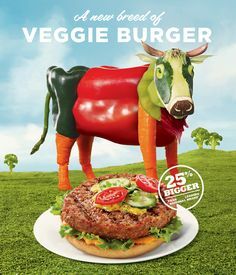 Reason 10) I am a vegetarian. Use your existing social and professional networks to establish a customer base for halves, quarters, and meat bundles. It will take a lot of phone calls and you should be prepared to give away samples. While farmers’ markets are typically not good places to sell large volumes of meat, they can be a good place for meeting potential customers, building a customer base, and taking orders for larger deliveries. ** Other places to promote your meat and/or gather potential customer names would be through any organization where people are likely to want to know where their food comes from and/or support local agriculture. This could include: natural foods stores, community supported agriculture (CSA) “veggie boxes” and other local buying clubs, churches, and public service groups. ** If halves & quarters are processed under “custom exemption” (meat has not been inspected), you can still deliver the meat at farmers markets, as a service to your buyers. BUT, for legal reasons, the processor MUST be paid directly by the person buying the half or quarter animal from you. I’d like to get the weekly email announcing new articles!